Well we can’t have everything all the time I guess. If someone else wants them badly and picks them up then we all still win. There will be other boots, other days... Also, very interesting day today in the office! We were all gathering for a meeting and the lady on our team said to me, “I wish I can walk in heels as well as you do.” I thanked her and wished her a speedy recovery for a foot injury that currently has her in a big plastic boot cast. She told me she has high heels at home, and asked how high mine are. At this point other people in the room are jumping in on the topic, and an older male colleague asked me if they were women’s shoes, because “you don’t see men wearing heels”. I replied “doesn’t matter, they are my shoes now” and the whole room erupted into applause. But he continued, saying that if I kept growing my hair out people will think I am female. At this point, another colleague weighed in and revealed that he used to wear heels when he was in college! Still, the response to this was taunting by a 4th person in the room, joking “well well, now we wonder what other things you wore in college”. Anyway, if the office had somehow not noticed my heels up until now, today is the day everyone discovered it lol. It was a nice light hearted discussion, no different from the usual chit chat about anything else like family, weather, or politics. Once the meeting got going it was business as usual, no big deal. I have been a heel wearer for a long time. First, the late 70’s platforms, then Cowboy boots. I found large size women’s heels on the internet and in one or two California “exotic wear” shops. I am six feet five with my bare heel on the floor, Size 13 (US) male feet with a high arch made for wearing heels comfortably. My legs are short proportionately - so a three to five inch longer trouser brings my appearance into proportion. I don’t consider what I wear cross dressing, but there are places and times I do not wear heels, though almost all the time my heels unnoticed, even if my ‘new’ six foot eight height does. My wife accommodates my choice, but is terrified that I will be recognized in heels and she will need to explain. So usually my public experiences are in cities I travel to when I touch a few extra articles of clothing, long jeans or slacks, in with the heels. The Jeans store Buckle has long men’s and women’s jeans. I am wearing their Payton bootcut jean with a 31 waist and a 37-1/2 inseem with a platform oxford from Pleaser that has a 4-3/4 heel at the back right now. I’m sure I’ll get lots of support and ideas from the members here. Sounds like you work for an extremely nice and forward thinking company - a real rarity these days. And so intelligent on their part as it must help staff retention in a big, big way. I’ve been wearing my OTK boots under trousers, but I more fully appreciated the role of OTK boots in winter weather tonight as when I ditched the trousers for my first extended outing in an edgier outfit. I bundled up like I usually do, but the OTK boots did the job of keeping my legs warm on my shopping trip to Last Call. I got a few long looks at my outfit while spending over an hour there, probably due to the more fashion-conscience audience and the fuller exposure of my footwear, but I had a good time shopping. I didn’t end up buying anything, but I tried on an item that had potential and gained general familiarity with the kind of brands Niemand carries. There is also a noticeable increase in boot inventory there over the last 7 days, indicating that we may be nearing the end of “boot season”. Among other things, some Stuart Weitzman OTK boots were sitting in boxes at the front of the store with 50% off, including a pair of Highlands in size 11 exactly the same as the ones I was wearing, but in light color. Clearly I did not need another pair, but the availability of larger sizes in Stuart Weitzman had been noted. Stumbled on this site just over a year ago and been a member for a while.I'm inspired by some of the members here past and present from reading their stories,seeing their pics and public outfits.My shoe collection keeps growing and becoming a little addicted now. I have been wanting to go public or at least get outdoors for sometime now, and wishing wont make that happen But I eventually got outdoors in heels. For the past few days I've been planning on my first outing on Friday night in central London. After meeting up with my friend i had a choice to either go home or face my fear and wear my heels which i brought with me. I stayed out and went to one of the major public parks which was pretty much empty. After 20 - 30 mins of being stuck in my head i got my Kurt Geiger booties out of my bag,got changed and started walking. And soon realised how much harder it is to walk with heels outdoors than at home.After walking around the park for several minutes I changed into my platform-less Simi stilletos which where easier to walk in. I walked around the park for 20 mins stopping a few times to sit down. Eventually I got near the road which was a little busy and without hesitation I started walking on the footpath next to the road. My heels where fully exposed (so where my booties earlier) as i was walking next to the road, and both my face and heels were visible to cars driving in the opposite direction. It felt good but I was nervous. After several minutes I got back into the park through another entrance. Nearly bumbed into a few people during my time there who could have noticed my footwear even at night, but Im sure some heard the sound. A few times part of me also wanted someone to notice me as a guy in heels, haha. Overall it wasn't a dramatic expirience compared to the early stories of others but for me it was about taking the initial step of getting outdoors and eventually making it a habbit. Since Im going to be heeling at night for now (when its darker and less busy in general), i dont mind my heels being exposed. A few times before i reached the road I wanted to call it a night as my legs were tiring but I'm glad I kept pushing my comfort zone and walking a little further with my heels exposed knowing i could potentially bump into someone at somepoint. Cant wait until Sunday night. Wont be wasting much time in the park this time, but only to get changed. I want to walk next to the road,residential areas and streets for longer, slowly pushing my comfort zone each time I go out. I will post some pics of my collection soon. My recent boots from New Look. So tonight I ended up going with one of my oldest pairs in my possession. I’ve had these for probably over 10 years and I just love them! 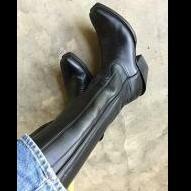 They are Liz Claiborne boots and oh so comfortable. I had the heels recovered in real leather a year or two ago and the cobbler did a horrible job, but I still love them. My latest acquisition: Payless "Zayden" over-the-knee boots in black faux suede. I wore them on an outing yesterday and found them comfortable and easy to wear, even though they didn't come in wide width. And, I caught a sale as they were on clearance and spent all of $15 bucks (normally $45) after shipping.